Get more value and get together at the 100 percent smoke-free and pet-friendly Clarion Hotel Anaheim Resort in Anaheim, CA. 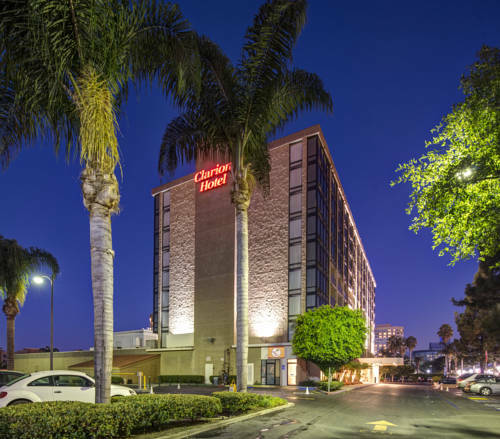 We are conveniently close to John Wayne Airport, Disneyland, Angel Stadium of Anaheim, Santa Ana, and Anaheim Convention Center and Arena. Life is better when you get together, and you can enjoy such great amenities as free WiFi, meeting space, business and fitness centers, outdoor heated pool, restaurant and bar. Your guest room features a refrigerator, coffee maker, hair dryer, iron and ironing board. Also, earn rewards including free nights and gift cards with our Choice Privileges Rewards program. Limit of 40lbs./pet, nonrefundable pet deposit USD25, USD10/pet/day. Parking USD14/day. - Sea World Of Calif.